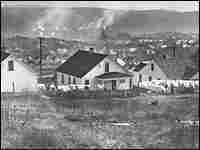 Smog Deaths In 1948 Led To Clean Air Laws On Oct. 27, 1948, the people of Donora, Pa., awoke to a thick yellow blanket of smog. They soon learned that 20 people were dead and half the town was sick. A museum has opened to commemorate an event that many say was the genesis of clean air laws. The mill town of Donora, Pa., seen Jan. 1, 1948. On Oct. 27 of that year, a smoky, lethal smog killed 20 people. The air was polluted by local steel plants, railroad yards and zinc works. Sixty years ago, an environmental disaster in southwestern Pennsylvania shocked the country. It forever changed the way Americans think about industrial pollution and their health. On Oct. 27, 1948, the people of Donora, Pa., woke up to a thick yellow blanket of smog. Charles Stacey, who was a senior at the local high school then, remembers his walk to class that day. "The smog created a burning sensation in your throat and eyes and nose, but we still thought that was just normal for Donora," Stacey says. Back then, smog often hung on until late morning in Donora, a small mill town about 25 miles south of Pittsburgh. The town's zinc plant and steel mill belched out endless streams of toxic smoke. But this smog was different. It darkened the valley for five straight days. That week, Stacey listened to the radio and discovered that the ever-thickening smog had turned lethal: 20 people were dead, and half the town was sick. He says everyone was overwhelmed by the havoc. "Right two blocks down the street here was the Donora Hotel," he says. "At one level they had an emergency hospital set up because the local hospitals couldn't handle all the people, and unfortunately in the lower level they had a morgue because the funeral directors were overwhelmed with bodies at that time." Donorans later learned that a cold layer of air had trapped a poisonous mixture of carbon monoxide, sulfur dioxide and metal dust. Stacey's father asked the owners of the zinc plant to shut down during the deadly smog, but they refused. For years, no one in town wanted to talk about what had happened. "It was sort of a black eye to Donora," says Don Pavelko, a long-time Donora resident. "I always heard, 'Let it die. Let it die.' " Pavelko says today, he and other townspeople want the world to remember. They recently opened the Donora Smog Museum to commemorate a tragedy they believe gave rise to something positive. To make the point, Pavelko walks outside the small storefront museum. The sun glistens off a flaming orange sign that reads "Clean Air Started Here." "We here in Donora say this episode was the beginning of the environmental movement," he says. "These folks gave their lives so we could have clean air." The Donora smog event, the worst air pollution disaster in U.S. history, let the public know that industrial pollution could kill. It eventually led to the Clean Air Act and state and federal agencies that regulate pollution, and Pavelko is proud of that legacy. Inside the museum, Pavelko shows an 11-year-old visitor photographs and artifacts. An old oxygen tank catches the boy's eye — the same tank a firefighter carried through the dark streets of Donora to help citizens survive the smog that put pollution control on the map.